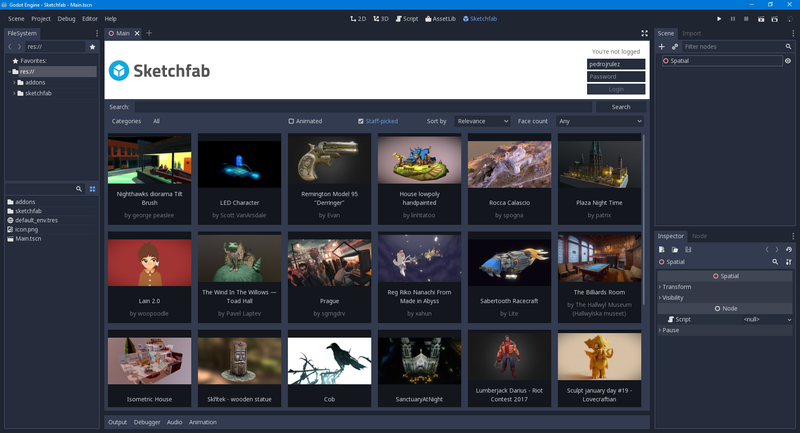 Sketchfab is a well-known site where you can browse a big library of 3D models and download them for use in your own projects. Many of them are free, covered by open licenses. They have just announced their download API (announcement), which allows third-parties to integrate with it, giving any application access to hundreds of thousands of models in glTF, a standard format that many tools, Godot included, understand. So it seems that more and more companies are taking Godot very seriously and it's becoming a big player in the game engine landscape. In order to run the Sketchfab plugin, you'll need to wait until the upcoming Godot 3.0.3 is released since it contains some needed bugfixes, that were done after the last official version. If you are a Windows (x64) user and can't wait, you can get a build snapshot from the plugin repository, under which it will work.